The Chevrolet Malibu was launched to compete with the mid-size imports from Japan. Like the Honda Accord and Toyota Camry, the Malibu emphasizes civilized road manners, quality construction, and buttoned-down practicality wrapped in innocuous if not anonymous styling. The driving performance of the Malibu exceeded our expectations. We were surprised by the acceleration performance from the V6 and delighted by the crispness of handling on winding roads. It feels firmer than the Camry, but softer than the Accord, a good balance, in other words. Malibu's solid structure is based on GM's new Epsilon platform used by a couple of highly successful European sedans. Along with its compliant suspension, this gives the Malibu a smooth, comfortable ride, yet allows for spirited driving. This is no mush-mobile. Steering effort is light at low speeds, so the Malibu is easy to maneuver through crowded parking lots and park. The cabin offers roomy accommodations for five passengers with comfortable seats and logical controls that are easy to use. It's quiet underway. And you can start the car remotely, a great feature on cold, winter mornings. No question, this is a highly competent sedan that's practical and easy to live with. The Malibu has something the imports don't: the Maxx. Maxx is a longer-wheelbase variant, whose extended roofline and rear cargo hatch suggest a sporty station wagon. While Malibu seems destined to disappear into a crowd, Maxx looks just as determined to stand out and be noticed. Starting at just a hair under $19,000 and topping out below $25,000, Malibu base prices are extremely competitive with the prices of the Honda Accord and Toyota Camry, which can approach $30,000 with options. The previous Malibu ranked tops in the midsize car class in the J.D. Power Initial Quality Surveys for two consecutive years; we expect the 2005 model to offer quality construction.!! 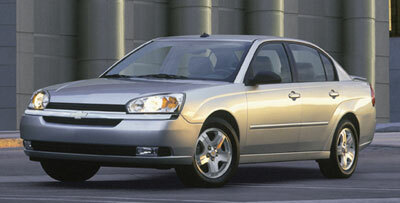 Malibu is available as a conventional four-door sedan, or as the longer-wheelbase Malibu Maxx. The sedan comes in three trim levels: base ($18,995), LS ($21,060), and LT ($23,855). The base model is powered by a 2.2-liter dual overhead cam four-cylinder engine. LS and LT versions come with a 3.5-liter overhead-valve V6. All models come with a four-speed automatic transmission. Standard features at all levels include: air conditioning; a power vertical height adjuster for the driver's seat; power windows, door locks and outside mirrors; tilt/telescoping steering column; four-speaker stereo with compact disc player; dual-stage front airbags; and 205/65R15 touring tires on 15-inch steel wheels. Anti-lock brakes (ABS) with traction control are optional ($400). A Preferred Equipment Group ($835) for the base sedan consists of: cruise control; remote keyless entry; power adjustable pedals; driver manual lumbar seat adjuster; front seatback map pockets; a cargo net; and the audio system that is standard in the LS. The mid-level LS comes standard with anti-lock brakes (ABS); traction control; cruise control; remote keyless entry; front-reading lights; map pockets in the backs of the fronts seats; power adjustable pedals; manual lumbar adjustment for the driver's seat; six-speaker stereo with Radio Data system (which displays the kind of station you are listening to); 15-inch aluminum wheels; a cargo net; illuminated driver's side vanity mirror and non-illuminated vanity mirror on the passenger side; and body color moldings. Side-impact airbags and head curtain airbags are optional for base and LS models ($690) and we recommend them highly. A package ($1,095) for the LS sedan includes: side curtain airbags; remote vehicle starter; carpeted floor mats; and six-way power driver's seat. LT adds: automatic climate control; seat-mounted side-impact and side curtain airbags; front and rear reading lights; remote vehicle starter; leather seats; heated front seats; 6-way power driver's seat; seat cushion storage pockets for outboard seating positions; leather-wrapped steering wheel with steering wheel-mounted audio and cruise controls; leather-wrapped shift knob; two illuminated vanity mirrors in front; fog lamps; power and heated outside rearview mirrors; body-color rocker moldings; a rear spoiler; 16-inch tires and wheels. An optional package for the LT ($1,230) includes a Homelink transmitter for opening garages and security gates; a light-sensitive auto dimming rearview mirror, XM Satellite Radio and a power sunroof. Maxx is built in the same three trim levels: base ($20,760), LS ($21,260), and LT ($24,405). But the base-level Maxx is better equipped than the base-level sedan, and comes with the V6, cruise control, traction control, anti-lock brakes (ABS), 16-inch steel wheels, power hatch release, and other highline features. Similar options packages are available for Maxx. A DVD entertainment center with wireless headphones and a monitor that flips up from the front console ($995) is available. Options for Malibu sedan and Maxx include: XM Satellite Radio ($325 plus the $9.99 monthly subscription fee); GM's OnStar communications system ($695); a power sunroof ($725); and a rear spoiler for the sedan ($175) or Maxx ($300). Three levels of audio are available, from the base AM/FM stereo and CD player to the top-of-the-line system with an in-dash, six-CD changer, six speakers, and automatic volume and tone controls ($300). A unique option is the remote starter ($150), useful both in cold climates to warm up the car before the driver climbs in and in extremely hot climates to cool it down. The Chevrolet Malibu looks more contemporary than its bland predecessor, with more character and class. It also looks more substantial, giving the impression it's a more expensive car than it is. And it is, indeed, more substantial, slightly wider than the model it replaces. The front features a chrome bar across the full-width of the car, with the familiar Chevy bowtie in gold in the center. The bar along, along with Malibu's squinty headlamps, attempts to invoke a family resemblance to Chevy trucks, which have been highly successful in the marketplace, but the design execution didn't work as well on this mid-size car. The rear of the sedan resembles the upright rears of European cars. And indeed, the Malibu shares its structure with the highly successful German Opel Vectra and the Swedish Saab 9-3. Malibu is built on GM's new Epsilon global platform, a front-wheel-drive architecture developed by a team of American, German and Swedish engineers. Epsilon is also being used for the new Pontiac G6. The bottom line is that the Epsilon platform provided good bones for a new Malibu sedan. From the center post of its roof forward, Malibu Maxx is identical to the sedan. From there back, however, Maxx is a different and more innovative vehicle. Maxx isn't larger than the sedan, but it is proportioned differently. At 106.3 inches, the wheelbase of the Malibu sedan stands at the small end of the mid-size spectrum. Maxx rides a wheelbase that's six inches longer, stretching 112.3 inches. Yet in overall length the Maxx is a half-inch shorter than the sedan (187.8 inches vs. 188.3). That gives the Maxx very short overhangs, a good thing. Maxx is a half-inch taller than the sedan. Its roof is longer, its trunk shorter, increasing space for rear-seat passengers. The Malibu looks as substantial inside as out. With 101 cubic feet of interior space, the Malibu sedan is extremely roomy for five passengers. The seats are comfortable. The front passenger seat cleverly folds flat for carrying long objects such as skis. The rear seat splits and folds 60/40. The interior is conservatively styled. Controls on the center dash are conveniently backlit for night driving. The heating and air conditioning controls were a little confusing, however. Likewise, the stereo seemed designed more for style than function, though it worked well. We thought the wipers were a little loud. And the triangularly shaped outside mirrors are small, limiting rearward vision more than we liked. Otherwise, it's a convenient interior. Lots of nooks and crannies are available for storage, including a center console with a roomy bin, four cupholders, a storage tray and a clip pad. Two 12-volt outlets provide power for whatever needs powering. Malibu Maxx offers slightly more total passenger space than the sedan, at 106 cubic feet. But more than that, Maxx offers increased versatility. Its rear seat is split 60/40 not only in the back, but in the cushion; and each unit slides fore and aft as much as seven inches to adjust between passenger and cargo room. Rear-seat passengers sit farther back in the Maxx and enjoy nearly identical room as the front-seat occupants, and as much as the rear-seat riders in a full-size domestic sedan. Maxx's rear seatbacks also recline for improved comfort. In short, the back seats of the Maxx are a comfortable place for adults. Standard in the Maxx is a fixed skylight over the rear seating area, so rear-seat passengers can see clouds by day and stars by night. Or they can close their individual sunshades. Back in the cargo bay, Maxx provides 22.8 cubic feet of space, vs. 15.4 for the trunk of the sedan. Fold down Maxx's back seats and the available space expands to 41 cubic feet. There's a 12-volt power outlet way in the back in addition to the two up front that it shares with the sedan. A four-position shelf in back can be configured for two-tier loading or as a table for roadside picnics. And of course the one-piece liftgate with remote power release allows you to load objects like appliances that would never squeeze through the sedan's conventional trunk opening. The biggest problem with the Malibu's interior, whether sedan or Maxx, is its inconsistency. Some interior parts are made from very high quality materials, such as the soft rubber door handles, which reminded us of Volkswagen, the benchmark for interiors. Yet, other parts, such as the plastic surrounding the audio and climate controls, appear hard and cheap. The ceiling area above the visors was lumpy, and the edges of the ceiling fabric where it was supposed to tuck into the trim was ragged; the handle for the lumbar support felt flimsy, and the seat fabric puckered. Our test cars were pre-production models and some of the finer points may be worked out in production. Still, we didn't feel the interior materials and workmanship, in general, measured up to the craftsmanship of a Honda or Toyota. The Malibu is designed well for safety. Dual-stage frontal airbags and three-point safety belts are provided for all occupants, of course, with safety belt pretensioners for front-seat passengers that cinch the belts tighter in a crash. The universal child-seat attachment is located in all rear seating positions. Anti-lock brakes and traction control are optional on the base model and standard on the LS and LT. Power adjustable pedals are standard on the up-level models. For 2005, Chevrolet has added seat-mounted side-impact airbags for front-seat passengers in addition to side-curtain airbags for the front and rear seats; this setup is standard on LT and optional ($690) on other models. A bumpy winding road quickly showed the Chevrolet Malibu handles well. Chevrolet engineers deliberately tuned the Malibu's ride and handling to fall smack dab in between Accord firmness and Camry softness. We think it was exactly the right decision. The rock solid body structure provided us with a very quiet and comfortable ride, yet allowed spirited driving. The chassis is well controlled. The electronically controlled steering is sharp and responsive. It provides the driver with more assistance at low speeds for parking maneuvers, with less power assistance at highway speeds for better steering feel. Both of the available engines deliver plenty of power, as well as good fuel economy within their segments. GM's 2.2-liter dual overhead cam four-cylinder Ecotec serves as the base engine. It delivers 144 horsepower and 24/34 mpg city/highway. GM's newly developed 3.5-liter V6 delivers 200 horsepower and a still-decent 23/32 mpg in the sedan and 22/30 in the Maxx. We were impressed with the extra kick the V6 gave us in highway passing maneuvers. Base models come with rear drum brakes. LS and LT models come with four-wheel disc brakes with ABS and Dynamic Rear Proportioning, which dynamically adjusts brake pressure between the front and rear brakes, improving stability and shortening braking distances. ABS allows the driver to maintain steering control under hard braking. The Chevrolet Malibu has a rock-solid driving personality, a nice ride, a quiet, comfortable cabin, and lots of safety features. The Malibu Maxx is a compelling alternative with its liftgate, adjustable rear seating, and the versatility of a small SUV, all in a package no larger than a mid-size sedan. New Car Test Drive correspondent Michelle Krebs is based in Detroit, with Mitch McCullough reporting from Los Angeles. Head/hip/leg room, f: 39.6/53.2/41.9 in. Head/hip/leg room, r: 37.6/52.4/38.5 in. Cargo volume: 15.4 cu. ft.